We didn't know it at the time but the early releases of 2003 were starting a trend for the entire year-to-date. With Final Destination 2 followed quickly by Shanghai Knights, the year of the craptacular sequel saw an early bloom. Shanghai Noon was a delightful movie starring Owen Wilson and Jackie Chan, and the two men proved early and often what impeccable onscreen chemistry they possess. The follow-up film, Shanghai Knights, decides there is little point in bothering to come up with radical new ideas, but instead chooses to solely focus on the dynamic between the two men at the expense of everything else in the story. The result is a remarkably inferior product when judged in comparison with its predecessor, and a dud of a film even when judged solely on its own merit. The premise here is that Jackie Chan’s character, Chon Wang, is for some obscure reason considered an outcast by his father. Apparently, rescuing their people’s imperial princess isn’t enough to get a nod of approval from Daddy. Meanwhile, the royal heiress is blowing him off in order to do the work of her people in San Francisco. Tough crowd. Fortunately (? ), a band of thieving marauders is about to give the residing sheriff of Carson City a way to bring honor to his family. Sure, in the process, his father has to be killed and his sister beaten up, but what’s life without a little bit of suffering? The point is that a reason has been given to re-unite Wang with his former partner in crime, Roy O’Bannon. With those two together seeking out marauders who have stolen Wang’s father’s imperial seal, hilarity is sure to ensure. Right? Right? Not so fast. Despite the prodigious dynamic that Chan and Wilson share, no two talents may be reasonably expected to overcome the lack of a workable script. While the duo provides several moments of profound charm, for the most part, they are overwhelmed by the lackadaisical style of the story. What could have been a tight 90-minute film with a few laughs is stretched to a gruesome two hours. While only four minutes longer than the original, it wound up feeling like a Titanic/Gods and Generals double feature. The problem stems from the lack of discernible goals. Rather than give the viewer a series of progressions in adventure, we are instead subjected to a rehash of various subplots from the first film. Roy is still an inveterate womanizer and a nogoodnik. His series of haphazardly thrown together lies again place noble Wang in a series of difficult situations, and the situation is made worse by the fact that Roy has demonstrated a total lack of savvy in investing the two men’s money. They are both broke and even worse, some large dudes are chasing after Roy. It’s a cheap excuse to show off the elaborate stunt sequences that only Jackie Chan can do, but there’s a certain repetitive feeling to the whole endeavor. The big change from the original is that the boys are forced to head to London, because that’s where Chon Lin, Wang’s sister, has informed them that their father’s assassin has headed. The British hijinks involve all of the expected signature tourist attractions such as Buckingham Palace and Big Ben. Strangely, though, these fall flat while the highlight of the movie is a simple scene in a marketplace that allows Chan to soar to new heights even by his laudable standards. He winds up in a fight that begins to oddly mimic Gene Kelly’s dance in Singin’ in the Rain. The precision of movement in this makes for one of the most impressive to date in 2003, but it’s sadly not enough to overlook of the other shortcomings of Shanghai Knights. The other big criticism I have of the movie is the way it wastes the incredible talents of Donnie Yen. The actor’s work with Jet Li in Hero was mentioned in a previous edition of this column, but his theoretically larger role as Wu Chow, one of the two bad guys, might as well has been written in the margins of the script as Generic Evil #2. He doesn’t even get to be Generic Evil #1 as that honor (?) belongs to Aidan Gillen as eurotrash blueblood Lord Nelson Rathbone. Neither character is at all memorable, which is always a danger sign for action flick. Kim’s nuts. 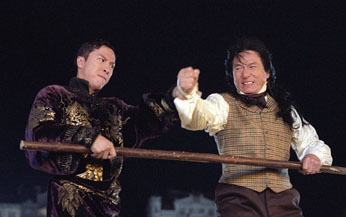 While Shanghai Knights is not a complete bomb by any stretch, it’s impossible to recommend given the sheer volume of shortcomings in the movie. Unless you are as big a fan of the two co-stars as she is (not bloody likely), this is instantly forgettable fluff and a definite pass.